Many people were asking about the sponges from the last posting. I was surprised how many people use Chanel compact. So I was about to post right after the last posting but by the chance my friends knew about the posting and told me not to do it. The reason is that the product is only sold in GS Watsons and they aren’t many stores around so if all the sponges are sold in the store that they goes to it will give them hard time to buy. I told not all people use Chanel compact and buys the sponge to calm them down. That is the reason why I am posting it today. I usually use foundation brush than sponge so I didn’t have in mind posting about sponges. However there were consistent request to do a review on sponges. Recently I did my posting on the cream foundation and there were so many questions than before about the makeup sponges. I can’t answer all the question with two sentences so I am here to review some of the sponges that have been are having interest from the users. Any one who is interested in make up have seen and used this sponge. In the past I was enjoying using this sponge and I am satisfy with it. I used it with foundation, base and etc. I have tried nearly everything that was in liquid. From than on I stared to open my eyes into other sponges. In those past days I can’t really explain but I felt some strong aura and stop repurchasing this sponge. First of all it really applies well. Same material as NR (Natural Rubber) sponge that gives sticky feeling like a gum. It is possible to control the thickness of the sponge by the amount of water. However when you wash it for several times the sponge begins to fall off from each other. Actually I didn’t think it was too expensive. ‘Oh oh it’s Shu Uemura that contains 4 sponges, is cheap cheap..’ I was saying that to myself as I purchased. Once I have used it I have to wash the sponge but it keeps falling apart making me think the life span is too short compare to the brand name. I don’t know if it’s expensive or not..it depends on the usage. Many use pentagon sponge for foundation but in my case I use it for only base. I look as if was made and use for only Shu Uemura’s hit UV under base product. There aren’t many words to say, applying it with sponge takes fair enough amout of UV under base and can use it quickly and smoothly. Also it is well used for applying other brand’s primer as well. I will talk about the reason later comparing with other sponges. I don't really recommend to use this sponge for foundation..well yeah. Sometimes it can be seen in magazines that Chungdamdong (central part in beauty and expensive place in Korea) artist uses this sponge very elaborately. Truly it is not real and can’t be because of the price. Also there are much better sponges out there than this. 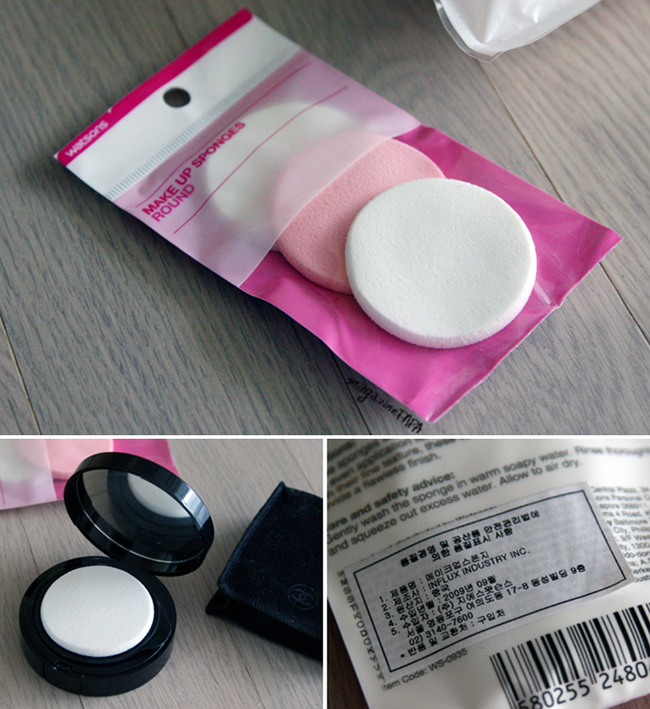 Many brides do their makeup in Chungdamdong so it is nearly impossible to use this sponge for all of them. You can’t even wash every time and can’t be manage in keep buying this so I guess it will really all have to be dumped into the trashcan. We always have to be reminded that professionals use other kind of product than what is actually shown in media. One of the weaknesses in using the sponge is the washing part. Even though it is washed, it doesn’t get white as like the first time. There is some stains that can’t be washed so how can you say it is same as like the first time. I can’t really understand. I can stand the parts that were falling apart so I used much of the different dimension of the sponge and than throw away. I brought all kinds of soaps to the bathroom to wash these sponges. At last I decided to cut after the usage this is better for the skin as well as for my mental health. I didn’t see anyone using this by cutting…;;; it’s not a rule to follow but its just my style. For anyone who washes his or her sponge can use it as it is. I want to show you guys how to do the cutting but I am ready done with the picture. Right now I am writing and totally forgot to do the cutting. I realized as I am writing...oh no.. I will definitely do it together with the primer. I will do it for sure. Known as pink or hot pink sponge. It was introduced a Hollywood celebrities using this product and advertise very little in Korea. When I first heard about beauty blender, there wasn’t any place that was officially selling this product but there are some stores now that does it. The special feature is the hot pink color shape of an egg or water drop. The price is about 30,000won that is too much for a one sponge. In Hong Kong, there were rainbow colors with same shape and texture that costs 5,000won. When there is enough water inside the sponge, it becomes it puffed up and its very cute. After squeeze out some water than use the bottom of the sponge where it stands on the picture to pat around the face. During this stage, don't spread out the product except pat it on the face. Use the pointed side for the areas around the eyes, nose and lips. It looks like it would do its job. Place the sponge straight down onto the face and where it merges press down so the area of the sponge gets bigger. Also not like the other sponge, the round part of the sponge makes it apply lighter and where it has to have two layers it won’t make marks on the face but do a smooth gradation. The sponge is curved and as well as the brush so it helps the products to apply well. Also for the people who have used sponge wont’ be a problem in going over a boarder line. You could use any sponge and fold them to make it curve. The size and other type of the Beauty blender are used only alone than with a brush. It will make it easy for beginners to use and applies very lightly. Can do the job very quickly and easily. 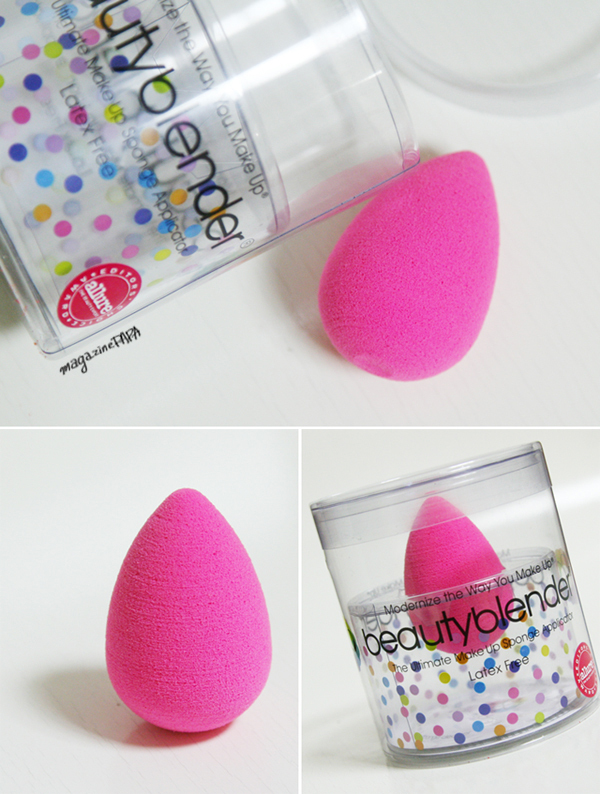 Cleaning with the Beauty Blender cleansing will make it lasts around 4-6months. But I am not sure because I haven’t used it for that long. Accept washing for the first several times the water turns pink. I don’t like washing the sponge but for my curiosity I did it and I went to buy the Beauty Blender cleansing to see the effect on the sponge. When I washed it with a sponge I thought it will clearly wash the sponge but there were still stain on the sponge. If I don’t take a picture before I would have showed a yellow stain on the sponge. This sponge is made with memory foam that is not commonly used as a sponge material. The outside looks like organic latex but it is very different. It is 100% made out of chemical materials. The tans pass of oxygen is not well done in memory foam so having it left around after using a liquid substance it might lead for bacteria to grow in them so have to be careful. That is why most of these days a pillow made put of memory foam is not welcome by the customers. So the biggest question was that how many times a week should I wash the sponge? I thought it would be fine to wash after two or three days after as I’m the only one who is using this sponge. Have to wash right after it was used so it is sanitary to use it but I don't know if I can wash right after.. Washing for everyday with 150ml will be difficult in purchasing the Beauty Blender cleansing. I have used the Beauty Blender cleansing and using variety of cleansing foams and liquid cleansing. However anyone who have allergy in rubber or have enough money won’t have any worry in purchasing the specialized cleansing. Purchasing this brush is a good idea if you don’t mind about the spending and your hand. But I actually don’t know why it is so expensive. This product is Clio tool brand doubletree. As I was walking on Apgujeong Rodeo road I saw a cosmetic shop where the sponge was hanging like that and I taught What kind of sponge is this? 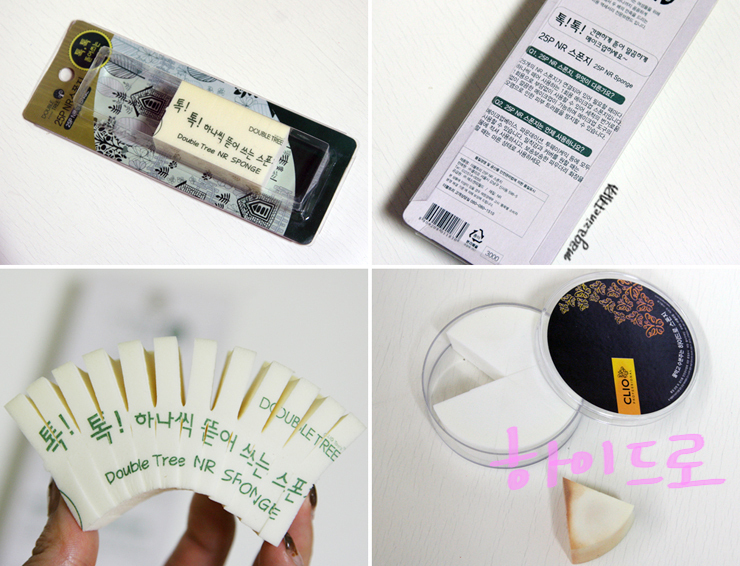 It is one time use product that you tear off after using it and costs only 3,000won. The bottom picture is the half of size after I used half. There are 25 pieces that are connected in total. So each one costs about 120won. Throwing them after one use won’t be a burden. Right? 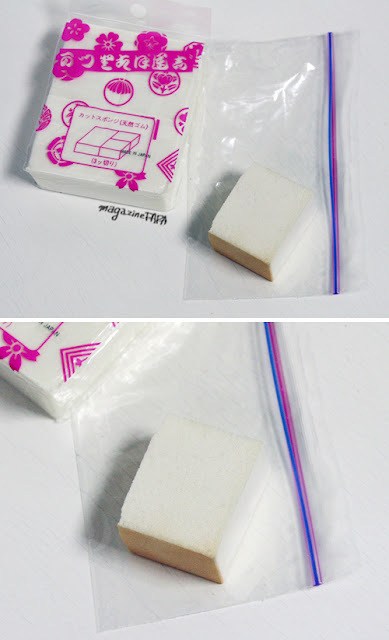 The size of a one sponge is 4cm long and 2.5cm wide and made out of NR material. It looks like it would be hard to apply but it is possible to hold it with 3 fingers. It isn’t difficult to spread or to pat. But the size is too small so controlling the thickness might need skill. It is possible to use with water or anything. It is only used for purity and for the person who really cares about sanitary and taste of throwing after a one use is good! This is the sponge has appear on covering the red blemishes. This applies well with water so it is kind of high tech product. For the people who have latex allergy won’t have any problem using this sponge as well as memory foam. Hydro sponge can be use when it is dry but many people like to wet it and use them. From that taste, many people can’t stop in using this. When it is wet, the size flow about 30% and gets softer. Have to squeeze enough amount of water in using this sponge and it is not just call hydro sponge. There is a difference between with other sponge as well. You can feel the absorbed water in sponge breaths out the water onto the skin. Well you could tell the difference by using it with the other sponges. Thinking that using same foundation with this sponge will make it more moisturizing is a big mistake. There is a difference for even people who can’t really feel it in providing the moisture. However after using the sponge, the moisture evaporates and there is no big difference between in finish touch with other sponges. But there is actually a difference in giving moisture to the skin. When covering, face blotches, marks, and red blemishes will bring the positive part of this brush and while you are using this sponge will make the skin moisturizing and less keratin rises. Any way the moisture evaporates but during the makeup it will support well so it is good! Wanting more coverage would make it much easier to do the makeup. The balance of oil and moisture depends on the base makeup. Hydro sponge could give quick and easy coverage. For the people who like to have light and shiny makeup I recommend doing it with brush. The sponge has to be washed and that is the reason why I mind about using the sponge. Especially it is used with water so have to extra careful in washing the sponge. However comparing to latex sponge it is easier to wash. When I wash with a same cleansing, it will give less stain. The sponge doesn’t easily falls off even after a wash so I taught about throwing the sponge after using it. The sponge is very washable that absorbs less cleanser and quickly be washed with less damaged. I bought 6 pieces but there is 1 piece that is sold. Even if you have covered it enough during the morning it is better to carry this kind of sponge to and do retouch. Wetting the sponge and squeezing the water after clean the face where you want to wash off and lightly apply the foundation. Coverage with the sponge will do without a mist. I can’t really remember the cost but it was around 2,000won. But in my memory it is about half of the price. I usually pay attention to the cosmetics price but I just got this during my glossary shopping. The price was really cheap costing about 100won per one. The sponge that is sold in the retail is made out of organic rubber name NR (Natural rubber). Comparing to SBR (Stylene Butadien Rubber) is adhesion better as it is made out of synthetic rubber. There are other more positives than adhesion but I’m not sure…. Any way synthetic rubber is not good for adhesion but have similar physical features with organic rubber so around beauty area many use organic rubber for blending. The flexibility and the texture are really high like organic rubber and it’s cheap. So I am saying that this product is mixed with synthetic rubber and organic rubber. So the texture is soft, feels very light, and flexible. It was mixed with synthetic rubber so the price is cheaper. The difference of adhesion can’t be really felt. For me I can only tell if it is pure by the touch and looking. In general the many quantity of sponges sold in a bag and is usually made out of synthetic rubber. I’m saying that it is not that bad but there are some people who have allergy in synthetic rubber. I didn’t have the allergy so I used it very well. it applied really well than I thought..It could use it as dry or wetting it with water. I sprayed the mist twice instead of water on the side of the sponge and the application of foundation was really easy to do with adhesion. It helps in doing coverage but personally I use it for doing it very lightly. I use foundation brush if I want to be more careful with my makeup but sometimes I want to have some dryness so I do it on those days. I used the large surface for the larger surface in the face and use the edge of the sponge for narrow places. I want the size to be bigger but I am satisfied as it is. I used it for a day or two than throw them away. Well..This is just right for not having too much hope on applying the makeup and throw them easily away. I stop to use doubletree sponge as I started using this brush. That was still inexpensive but the size was more comfortable to use. Even though when you buy it for a regular price is still cheap but sometimes it is sold for half price in E-Mart. This sponge is kind of additive and next time if I see this sponge on sale in E-Mart I might buy as many as I could. I was satisfy with the product A so I when around E- Mart looking for more sponges. I was unsatisfied with the product. 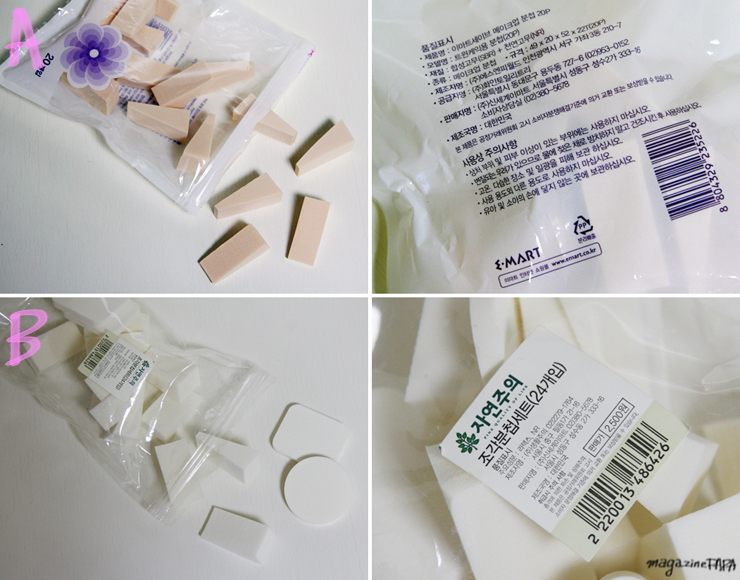 The triangle shape of sponge was usable that helped to apply well like jelly type texture. Round and triangular shape sponge is like the latex pillow that have too much of adhesion leading to making it stiff. Depending on which foundation to use it makes the foundation not to settle on to the face with less adhesion. The price is similar to brand A but the price was double so…. It made me to think that price was expensive. I was about to use it quickly and than throw it off but I didn’t get to use that much. If you want to buy organic sponge, than buy a sponge that have triangular shape with no synthetic brush. This sponge is more familiar known to artist than the public made out of organic rubber sponge. See by the appearance it is similar to Shu Uemura’s pentagon sponge. When you also wash this very strong, it will slowly fall apart. But there aren’t many people who use this by washing. They would normally cut out the used part. When you are cutting this, you have to slices the part so it becomes flat surface again. Cutting this brush is needs some technique to do so it will be hard for someone who is not familiar with using the sponge. I will post on how to cut sponges later so watch for the posting. But I don't really recommend using this sponge by cutting because it isn’t easy. There are 3 CUT and 6 CUT. In the picture is 3 CUT. From the 3 CUT you cut the biggest one in half turning it to 4 CUT. The size is much bigger than 6 CUT so it’s easier to use. There are several reasons why this sponge is representative of Chungdamdong. The material was well known trough artist that was similar to Shu Uemua’s pentagon sponge that you buy 4 pieces for 7,000won. For this sponge and pentagon sponge you have to cut them as you use than to wash. Cutting the pentagon sponge is too small so can’t used as many times as this sponge. The size is bigger so by slicing them off could be use for quite sometime. The sponge is not washed so the quality stays the same as you are cutting the used part making it usable to many different people. That is why many Chungdamdong artists use this sponge for doing makeup to many people. Piccasso Brush only supplies this sponge. I don’t know how they could but there is a big difference on buying online. Mizziyoshi sponge is like the eyelashes to makeup artist on how it places a big role doing the makeup so the price is important as comparing to having them to be cut. You could purchase online but Piccasso brush is not selling into public these days. 3 CUT sponges are used in Chungdamdong for not applying the foundation or BB cream. After applying the foundation with a foundation brush the sponge is used for patting the product onto the face. But normally it is used for base or primer for the face. It’s quick because of the big size and applies with great adhesion making the product well set onto the face without absorbing the cosmetic too much. There is any sponge like this for removing the unsettle makeup and applying the primer to clean the surface. The material is organic rubber so there are no stimuli on face due to the feature of the organic rubber. Anyone who tried using this sponge or just by looking at it can tell the difference. That is why it is easy to remove unnecessary dusts on the face. Evenly applies the base products that can apply very thin and covers the area smoothly. 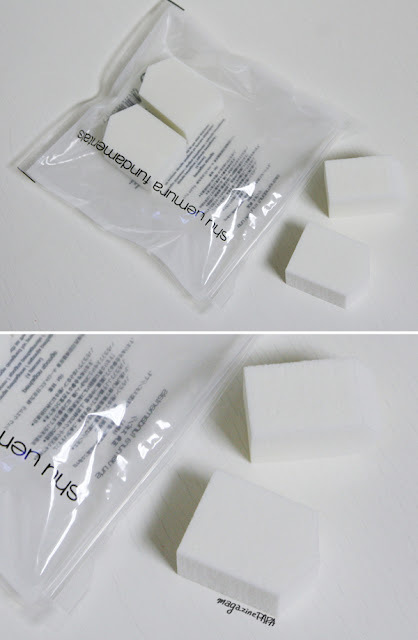 It is similar to Shu Uemura pentagon sponge. That is why I don’t really use sponge for applying the foundation. When you pat the sponge onto the face there is no problem on covering but it is hard to apply thin and some disruption. Once again to clean up the points. NR+SBR or memory foam sponge is soaked in water for to use thick foundation. In NR, Mizziyoshi or Shu Uemura sponge is organic that is used for doing the base, primer, or removing the unsettled makeup. I have spread these sponge for people to see the difference clearly but for the people who can use well is fine for what type of brush to use. Brush can be used like the sponge as well. For the people who can’t purchase Mizziyoshi for lower price than go for Shu Uemura sponge. You could use your hand for applying the base but using the sponge for covering the pore and using the primer can be well used. On the posting about primer it might be featured by Mizziyoshi or Shu Uemura sponge. This is the perfect size for Chanel’s palette. I had hard time finding this but once I have found it, my friends were cheering very enthusiastically. They have recognized my searching ability. The problem was the size of the Chanel palette. One day, I heard about the subway on lane 9 that was newly built was so fast that led me to try riding it. So I parked my car somewhere and rode the subway. It was really fast and I stopped at some station and I saw GS Watsons. I was sucked into the store and I have found the sponge. The size was much different comparing to other sponges. I didn’t have super natural powers so I cant exactly measure by sides so I took out the Chanel palette from my bag and place it on the side of the sponge. At that moment, like in the movie, I was riding a time machine going back to the past to the present going trough all the mythical high way. I saw something like this in movie and for a sec I was wondering and I have took all the five pockets of sponges. It was SBR material containing enough adhesion and smoothness. According to the sponge material it applies the solid palette evenly. Among the 3 sponges, one is color pink giving fresh feeling in using the sponge. The size perfectly fits inside the Chanel’s case and closes really well. I have picked this sponge just looking at the size but once I have use this, I like the material of the sponge as well. Using solid palette like Mac, Clinique, Laneige and other more I had to throw away the sponge after washing them for 1 to 2 times. After that I have used other products for alternative use. When I used this sponge, it applies well and smoothly. It fits into Chanel so it can fit into any other round compact. However just to make sure check on the compact you have if it matches. I remove the oil with the oilpaper or using the tissue. Use the sponge without placing the product and clean off from inside towards outside of the face. Do it as if you are applying the product so it cleans up the uneven tone on the face. After that spray the mist for moisturizing and lightly pat it with your hand. Put some solid foundation on the sponge and start covering. Apply several time where you need some coverage. I am only talking to the people who own solid compact and not saying that this sponge is good for all kinds of foundation. Use foundation brush or any kind of tool as like as now. I use this sponge side by side from 3~ 5 days and throw them away. Comparing to department refill sponge it costs about 4~5,000won per piece, so price is much cheaper. However this sponge absorbs the product as quickly even the moisture in the product. The application is matt than actual product. In that moment using the wet sponge will provide with adhesion and very moisturized. You might think that mixing with water on the sponge with foundation might making it watery and lessen the coverage but wetting the sponge not like dripping wet, it will lessen the absorption of the product but releases easily to give great coverage. Of coarse when you add more moisture. After applying the product all over the face, place some limited amount of product on the sponge and pat it on where you need more coverage. Not only for solid foundation but also for powder foundation. Even though it is a powder using the wet sponge helps to have easy retouch with enough coverage. People might think that using the moisture sponge helps to give shiny finish but don't expect to have it. Maybe it might look during the application. It doesn't depend on the quality of sponge so doesn’t give shiny finishes with having the water on the sponge. When you think if it can fix by water on the sponge, what do people suffer from dry skin. It is just how you apply with enough amount of moisture but hard to sustain with the moisture. So the base makeup has to be balance with moisture and oil. According to the skin type, the product that contains glitter product will provide give elegant shimmer. I just want to tell you to don’t me mad at yourself because you used with sponged soaked with water wont’ give you flawless skin. Living through out life, there are some people who uses a sponge that they don’t wash for ages and some worst. Even there are some people who washed the sponge for so many times and falls apart but doesn’t care about it. Normally washing the sponge could lead up to 4~6months but it is better not to use past 3months. When you wash often, sponge changes….in terms of absorbing the product and exuding the product changes. 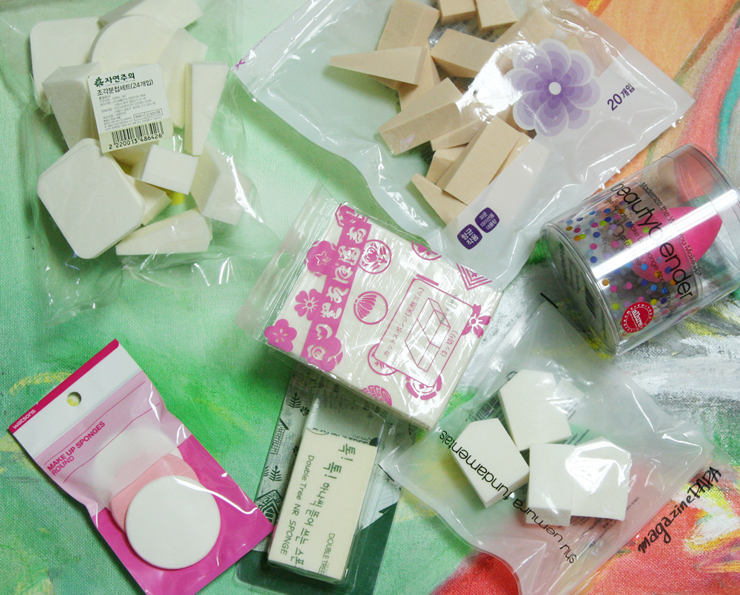 I often used washed sponges for 2~3 weeks and using it for 3 months is too long for me. You might feel the difference compare to the first time when you use the sponge in a wrong way for a wrong time. When I wash make up bushes, I don't use makeup brush only cleansing. When you know the ingredients of the makeup brush cleanser there aren't really anything. People might think that using the brush cleanser looks sanitary and lessens the damage but actually it isn’t. Also washing the sponge for many times would eventually lead to damaging. There are some products that don’t wash off the brush cleanly as expected when you have try using them. The temperature of the water should be lukewarm. When there is a time you have to wash all the brush all at the same time so pour some soap into the water and pour all the brushes onto the water. This happens to only lazy people… including me..
Wash the brush gently and sometimes roughly vise versa. For the cleanser use a body cleanser or liquid type of cleanser that gives enough amount of bubbles. Of coarse if you have cleanser, you can use those. When you have a lot to wash than pour the cleanser on the water. As you have washed it enough change that water and rinse the soap off. Cleansing one by one using a soap or foam cleanser to make enough bubbles to wash them off. After that wet it completely and than wash it like as you are washing a sponge. Rinse off twice or so according to the condition of the brush. Don’t use the cleanser all at once but just to give enough bubbles. It I better to use less soap and wash it for several times. For the sponge, people might use cleansing oil thinking that it is same as washing the face. Even though it is a good cleansing oil it is hard to remove the oil completely. Cleaning with the soap or a foam cleanser won’t wash away the remaining oil. The oil might be inside the sponge, which is really hard to rinse off. Well there is noting much in storage. Stored the unused sponge rather than to trying to store a washed sponges. It is better to use it quickly and throw them away. The sponge that was contact by the water will be easily be damaged so throw them away after a possible usage. Stored the unused sponge away from the heat and the light. A certain degree of heat might not be in the house to cause damage to the sponge. However from the direct sunlight could change the color and the texture of the sponge. When you are carrying your sponge, use a case that is on the picture. This case was from Mickimoto’s sponge when I bought the foundation it came along. The case was strong and easily doesn’t get stains on them. I usually use makeup brush than a sponge. However placing onto the makeup box is useful. You can easily get that when you purchase cosmetics. Don’t throw them away and use for portable sponge case. If you don’t have a case, use a zipper bag that is size of a hand that fits into a pouch. It states ‘Mini Zipper Bag’ so putting inside this bag won’t make the sponge dirty as well as the pouch.